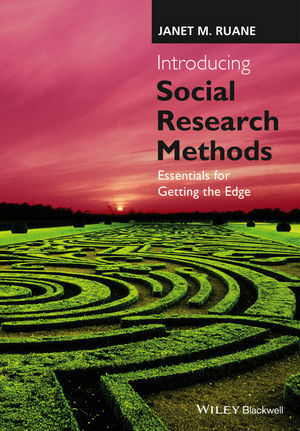 Introducing Social Research Methods: Essentials for Getting the Edge is a concise and student-friendly introduction to research methods that uses examples from around the world to illustrate the centrality of social science research in our everyday lives. Janet M. Ruane is a professor of sociology at Montclair State University. She is the author of Second Thoughts: Sociology Challenges Conventional Wisdom (with Karen Cerulo, 6th edition, 2014) and has published articles in an array of prestigious, peer-reviewed journals, including Social Psychology Quarterly, Sociological Forum, Sociological Inquiry, Law and Policy, Communication Research, Sociological Focus, and Science as Culture. With over 25 years of experience teaching research methods to undergraduates, Professor Ruane is an ardent supporter of education as a tool of empowerment.